Believe it or not, this is a Facebook change that you’re going to like. Since Facebook went public as a company, they’ve instituted a boatload of changes to make it harder to market your business on a Facebook page without paying for promotion. Yes, you still get some free exposure, but they took something that was super-effective and changed it into something that was hardly effective at all, making anyone who relied on Facebook for their marketing strategy rather upset. Last year’s algorithm change was particularly destructive. But this week, Facebook changed their promotional guidelines for the better. No, really. Hard to believe, I know, but it’s true. So lets dive in and see what this means for your business and how you can use it to get more clients. Previously, you had to use an app to run a Facebook contest. It was annoying and required you to be an app developer (or hire one). But now, Facebook is allowing you to use likes and comments as voting mechanisms! If you did this in the past, you risked having your page shut down and losing all your fans. Now, you can do it unabashedly and milk all the benefits. There are still a few restrictions, but they aren’t bad. For example, you can’t have people tag themselves in an image unless they’re actually in the image. You also can’t ask people to share something on their timeline or someone else’s timeline as part of a contest. You’ve also required to state the terms, conditions and official rules of the contest as laid out by law (but that’s nothing new). But otherwise, they’ve opened the doors up wide to make it easier to run contests and promotions on Facebook without breaking the rules. Awesome! You can read the exact guidelines in section E of this webpage. Here’s a few ideas for ways to run contests on Facebook with the new guidelines. Create a gallery with a single image from each of your clients. Then, tell your clients that the photo that gets the most likes and comments wins a prize of some sort, which encourages them to send their friends to the album to vote on it. To make this particularly effective, you could give bonus points for leaving specific types of responses in the comment section. So, you might link to a blog post that has more images from that session and ask people to comment with their favorite image from the session. Or, you might simply link to the original blog post and tell people that they can see more images of your clients by visiting the website. Give a prize to the person who gives the best caption to your photo in the comments. Award the prize to the person whose comment gets the most likes. Be careful with posting photos of your clients for caption contests, though, as some people might not be sensitive to the fact that they are your clients. Photos of animals might be an okay subject for the post, though. This is a great way to do market research. Ask a question such as “What are your favorite places to shop?” and offer a $50 gift certificate to that store for one random person. It’s a great way to learn what brands and stores appeal to your fans. Then, either pick a random winner each month to win a prize, or give them a free gift print or something if they get a certain number of comments or likes on the image. You can now embed Facebook posts on your website or blog to help get more engagement on them. So, create a blog post with images from your client’s session. Then, create a Facebook post that links to the blog post. Adding an image will help it be more easily seen in newsfeeds, although I’ve found that regular links tend to get seen by more people, so pick which ever you prefer. Now, embed that Facebook post at the bottom of your blog post and give a free print or some other small incentive if they get X number of people to comment on the embedded post. The reason this is smart is because that post will get shared more on Facebook since you’re getting lots of engagement on it. So it’s like free Facebook advertising without the “Sponsored” link on it. Here’s what an embedded post looks like. Please leave a comment on the post and try it out! Post by The Modern Tog. 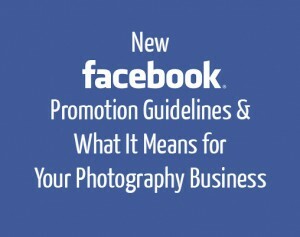 Want to read more details about the Facebook Terms of Service and what it means to your photography business? Check out this post over on The Law Tog.